Minims and crotchets: surviving British musical notation | Notes from the U.K.
She’s not explaining the Harry Potter universe but musical notation in British as opposed to American. I give her a panicky nod, but I don’t fool her, because she stops before she gets to the full breve—which has a long E so that it sounds like breathe, in case you need to know that. And crotchet is pronounced like crotchety, with a T you can actually hear, not like that thing you do with a length of yarn and a crochet hook. I explain to G. that I learned to call them whole notes, half notes, quarter notes, and so on, and she seems to believe that if I learn to translate those into the terms she knows we’ll be able to discuss time—that’s time as in music, not as in clocks. But because the eyelids of my mind fluttered when she said “It’s simple” and shut completely when she got to the quavers, my end of the conversation is mostly hand signals. I’m trying to show her the written notes, for some reason, with my fingers indicating whether the notes have stems and whether they’re filled in or hollow in the center. 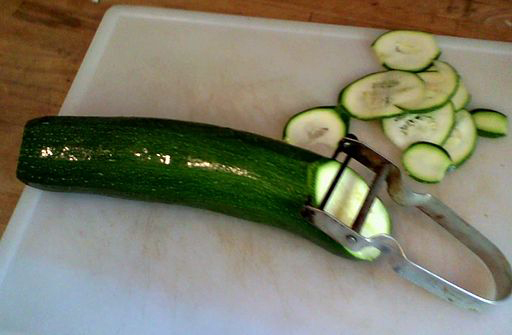 A courgette. Or a zucchini is you prefer. Photo by Mmm Daffodils, on Wikimedia. A courgette, in case you need to know this, is a British zucchini. Somewhere in the midst of our run-through, I’ve fallen foul of a hemidemisemiquaver. Or something very much like one. There is such a thing. Really there is, although probably not in “No Courgettes.” I can’t say for sure because I wouldn’t recognize one if it snapped my finger off and added salt. All I know is that they’re very short, but then so are piranhas. So am I, if that’s at all relevant. I’m not completely uneducated about music. I took piano lessons as a kid, and I’m sure you could have found a more resolutely untalented student somewhere but you’d have had to look hard. The lessons were about either classical music or some damned silly song about my pretty dolly, and I wasn’t interested in either of them. I don’t remember how long I took lessons for. It seemed like forever, and my teacher must have felt the same way, but given how little I know it could have been no more than two months. I came out of it almost able to read music. I can follow the treble clef if the notes don’t go too far above the stave and the time signature doesn’t get complicated and there aren’t more than one or two flats or sharps. Forget about the bass clef—I can’t read that at all. To translate that, if we were talking about words, I could read the vowels but not the consonants. It’s ever so handy. No one, in all the time I took piano lessons, ever mentioned a minim, a crotchet, or a quaver. She manages not to pack up her guitar and leave. It helps that one of the cats has crawled into the case and gone to sleep. This entry was posted in Music and tagged Americans in Britain, Americans in England, anglophile, Britain, British and American English, British English, Folk music, humor, singing by Ellen Hawley. Bookmark the permalink. Oh gosh, you’ve made me laugh out loud! I was brought up with crochets and quavers and as a child felt very proud to fudge my way through Pachelbel’s canon with it’s demisemiquavers. My ‘joy’ started in Germany – they use the ‘half note, quarter note’ idea. Yes, maths is connected to music but then they make things difficult by calling B flat a B so then of course they need a name for B so it is turned into H!!!!. I played in an amateur chamber orchestra in Cape Town and our German conductor was always getting the notation confused. What fun we had! And no I can’t read the bass clef either without ‘counting it out’. An H? I’m not sure my already shaky attachment to musical sanity will survive this news. My friend G. is fond of saying, when musical life becomes confusing, “Just launch it into the key of zed”–which of course I call “zee.” But she, at least, is joking. I think. Why don’t they call a B flat a B flat??? German notation uses suffixes for sharps (=is) and flats (es, reduced to s after a vowel) and so B is already B flat, hence the adoption of H for B natural. And apparently it’s fairly common in Scandinavian and Eastern European countries, too! I do believe that’s even more confusing that minims and crotchets and hemidemisemiquavers. That sound you hear? It’s me sinking beneath the waves of musical notation. In Norway they are called the equivelent of whole notes, half notes and so on. Calling them anything else sounds very confusing when you’re used to this. In Afrikaans we also speak of full, halve, quarter notes, etc. It just makes it so much simpler. I’ve no idea which English terminology they use over here as I was taught music in my own language, but I’m going to go out on a limb and say probably also the British version. We are a former colony of Her Majesty’s, after all. What you call a courgette/zucchini looks like what we call a baby marrow over here. I’d have been tempted to ask if they think it’s okay to use that kind of language around children. Your description is amusing and yet how frustrating that normal things are so different! Of course, a cat in the lap helps every situation. But don’t you just love how enriching it is? Never a dull moment, even when you think you’re speaking the same language! I feel deeply enriched. Especially when I think we’re speaking the same language. You think we’re speaking the same language, but actually we’re often just talking at the same time! I suspect that’s as profound as it is funny. Sadly, it can be scary too!